ClarinoxSoftFrame is our framework which forms the backbone of all Clarinox solutions. 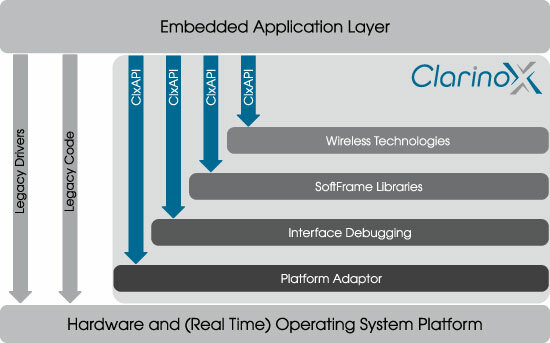 ClarinoxSoftFrame middleware facilitates the fast development of robust wireless embedded devices with protocol stacks and debugging tools. Clarinox’s expertise and vision helped lots of organisations minimise unnecessary costs and focus on the real business value. ClarinoxSoftFrame provides all of the listed benefits to all of our wireless solutions. You’ve experienced the hard way - let ClarinoxSoftFrame make your next embedded software project easier. This middleware provides all the necessary infrastructure for the embedded software engineer to develop without the need to know the real-time operating system (using Microsoft Visual Studio C++ or GNU tools as appropriate). Prototyping and simulations can be done, without the need for hardware, on a PC running Windows 2000/XP or Linux (e.g. Ubuntu/Debian, RedHat, Suse and embedded distributions). Threading, Timer, Semaphore, Mutex, IPC message passing, Event handling, Finite state machine. ClarinoxSoftFrame provides standard libraries, memory management functionality for deterministic execution on all platforms. Debug, trace and profiling functions improve the product quality and speed up time to market. The Platform Interface guarantees the smooth porting of applications to different hardware. Add-on protocols instantly put your team ahead of the competition by providing off-the-shelf wired or wireless protocols. Many platforms are supported, see supported hardware and supported RTOS. Hides the complexity of the incorporated functionality from the end user using an object oriented approach in C++. Tools library for fast efficient and consistent handling of lists, arrays, multi-processor based remote procedure call, encryption library, memory pool management etc. Project structure and infrastructure code for the application modules are generated automatically thus eliminating some possible errors, such as memory leaks. Network protocol stack providers do not provide visibility into the customer application. We do provide middleware and debugging tools to enhance the visibility while being a "one-stop-shop"
Robust, well tested on many RTOS, IDE and processor architecturesClarinox provides both Windows and Linux versions of the infrastructure so users can develop their applications on a desktop environment and move directly to the target platform with confidence of compatibility.